X-Universe - X-Men Red #1: THAT's why?! Subject: X-Men Red #1: THAT's why?! THAT's why they're called "RED"? For a forced last page gimmick pun? Title Page: Not including Gentle and Trinary makes NO SENSE. It's like a diss, really. 08 UGH. Lazy flashback timestamping. How many months after Phoenix Resurrection? Why no mention of said mini? The art... questionable for the rest of the ish. They can detail some squiggly lines but can't even throw in some cool or creative actual street name? 12 Okay, THAT's got to be Syrin and Banshee equivalent showing. 13 Jean and Kurt show up for your random/standard first encounter with a new mutant scenario. Apparently they only need 2 (unless it's 4)... uhh, cuz it's only a baby? Okay, and if Jean gave a heads up call to Laura then she should've had 'em bring earplugs. 14 Impressive and sweet showing for Jean. 17 What do we think of Jean's showing here? She's pulling a Superman or high-end showing of DD as they can read the simultaneous minds across great distances on a whim. It's not even clear what or why she's doing it here. 19 The story gives us 2 missing months and now throws us right into the middle of her post-Resurrection and reborn-motivation. Seems a bit lazy to assume readers can presume why this is such a logical step in her unrevealed quest. Jean doesn't even know what to do next - or is she fishing for better ways to go about unsaid idea? Sooo, all these pro-mutant world laureate agreed to gather for a group mind meld to a known Omega Telepath or unknown one - either way is forced plot device rush?? 22-23 She's recruiting Atlantis more than just Namor. She needs a country behind her to turn wheels at the U.N. Hmm... Magneto failed at that and Xavier/Scott/Kitty didn't even try that route. Just saying. Plus, her trip underwater is a notable power showing. Empty Namor inclusion. What reactions did YOU have? Yikes! And now the team has to live up to that? So much for healing the world. So... it's going to be an ironic name? Well, they sort of haven't joined the team yet because of that in medias res thingy. It is only those faces in the dramatis personae. Aaand... that's enough Latin for today. Not really a full page. Yeah. Odd to make it Roosevelt Island. Why not the Bronx, where the girls live? Meh. Well, I'm glad she did no mindwiping. Well, it's clear what she's doing, but yeah... Why there? She should be able to read all that hate from her comfy apartment. It's pretty clear what the plan is. Why's it going to work this time? It's... just so unworkable. Just like the UK ambassador says, mutants are not a nation. They're not even a singular social group. Problems, but actually better than I suspected. No - or at least I don't think so. They're called "Red" because Jean has red hair. And remember when I said I got a Supergirl vibe from that page where Jean first arrives? That vibe continued for the whole issue. Weird as this may seem, this book (intentionally or not) is setting up Jean not only as the alpha female mutant but as the alpha female superhero. Even with a movie on the way, Carol Danvers just can't seem to seize that role. I bought the issue. Jean as Supergirl was just the hook I needed. They don't appear in the rest of the issue because it's all flashbacks and apparently they weren't involved yet. 08 UGH. Lazy flashback timestamping. How many months after Phoenix Resurrection? Why no mention of said mini? Because that mini was meaningless and stupid? But of course, I didn't read it, so what do I know? The art... questionable for the rest of the ish. It's questionable, period. But I like the red and blue of Jean's costume. It's always striking whenever she appears. In fact, every panel that has Jean in it is beautiful, no matter what she's wearing. These artists portray red hair as a transcendent aura of awesomeness. They can detail some squiggly lines but can't even throw in some cool or creative actual street name? You actually looked for a street name? I love you, man. 16 Lydia Nance was kind of interesting as the anti-mutant face and this Harold Nobody seems uninspired with his intro. What's worse, with all the solutions Jean TP'ed for Toby - why the heck did she not just wipe the memory of the baby from the few people that could have possibly seen her. Bah. Supergirl. 1963. 1975. Alpha female mutant. Alpha female superhero. Here we've moved beyond Supergirl into Messiah territory. This is the sort of thing Wonder Woman probably dreams of doing. Jean is acting out Diana's highest aspirations. And she's doing it with Martian Manhunter's signature ability. Jean has absorbed the DC Universe into herself and transcended it. This could be a Watchmen story. Jean could be Doctor Manhattan. Hmm... Magneto failed at that and Xavier/Scott/Kitty didn't even try that route. Just saying. Plus, her trip underwater is a notable power showing. Empty Namor inclusion. Why is it empty? She and Namor needed to talk. They talked. Cassandra Nova, I mean. She was good during the Grant Morrison run, and that part of his run is classic. E Is For Extinction is, anyhow. She's about as powerful as Jean, isn't she? First off the very entertaining Supergirl TV series was taken off my cable TV package shortly after the first season. Melissa Benoist is supersweet as the Kryptonian. Can't wait for local library to get Seasons on DVD to watch ASAP. The Supergirl comic book direction lost my attention around Convergence (or maybe sooner). Recent solicits suggest copying themes from the TV show which questions creativity. Shades of Nick Fury. Is Kara's book any good? Fair enough. Still it worth a nitpick, imo. It's the team premiere - show the team. And "effectively" they DO appear in the book. Also, Marvel sometimes use the headshots page as cast credits indicator who appears, like this ish, but sometimes as a roll call page - just like Avengers No Surrender issue out this week, too. Because [Phoenix Resurrection?] mini was meaningless and stupid? But of course, I didn't read it, so what do I know? Well, it was the where/when/why/where/how Jean came back to life which means something. The "2 MONTH GAP" is only about 25% as annoying as the 8 MONTH GAP after Secret Wars but it's still lazy exposition of her assimilation and reactions of everybody else that followed. No real complaints with her costume. Well, the mutants and their 'public' school are on display in Central Park so secret identities are probably not priority anymore. Still, it was an odd gesture in light of general personal privacy. The whole public display angle seems underplayed and should be as key to the characters as when IM, DD, Spidey, etc. have been outed in the past. Sentinel Programs, Stevil's HYDRA America, evil anti-mutant groups, etc. probably have reams of census data on mutant aliases by now. Is Wolverinelaura living under her real name? Are X-men codenames a waste of time or just a means for deniability now? So many aspects of mutant acceptance can be inferred by Jean's gester here. Absolutely unethical. But debatabley still a thing an X-man might do. A smart thing to do? Lesser of 2 evils (from the X-men POB)? X-Telepaths have done mega-worse mind tweaking by comparison. Toby has just been marked for life - and Jean's new 'tude has her okay with that? So, no big deal to her if every global supervillain knows where to find any Omega Level living at the Mansion? Your parallel impressions to the DCU... abound. It's fascinating how she formulated the idea. She linked the greatest minds on Earth into a super-mind and used it to super-compute a plan she couldn't have conceived (probably no one could have conceived) independently. We've never seen this before. So of course Kurt is the first one told - Kurt, who once was studying for the priesthood - Kurt, who knows what it means to serve a Messiah and has longed to do so. The soul of the X-Men. It will be interesting if they ever compare notes about being reborn. They probably should; it will be a challenge for a writer to make such a story entertaining - not to mention relatable. Hate the lack of clear dynamic between Jean and her so-called long lost X-family. All we get is the gist. Jean wants him on his team and his country behind her and she got it. No motivation like we get with T'Challa. No reason for him to rejoin the X-men - or indication that he already was a member in the past. No Atlantean Nation status or Secret Wars followup. Empty, imo. Did you take Mutant Nation as a people and not a land? Can the U.N. admit a race instead of a country? Latervia may or may not still be a member but certainly fugitive Iron-Dr.Doom-Man doesn't/shouldn't have one ATM. I don't read it. 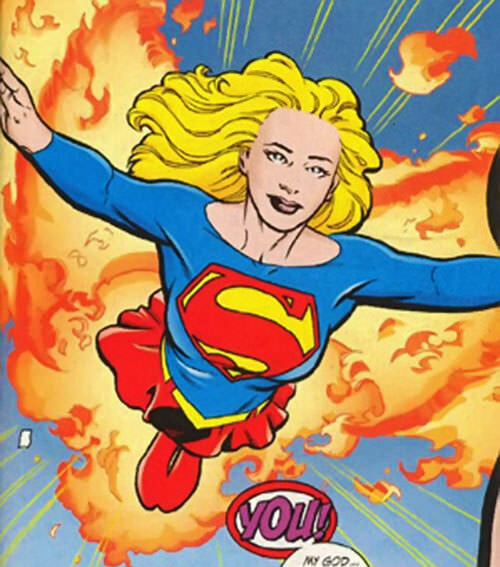 I haven't cared about the in-print Supergirl since Crisis on Infinite Earths obliterated the Silver/Bronze Age real McCoy, whom I loved for decades. I watched the TV show for a season or two with my younger daughter. It was pretty good, I thought. True. I probably have less interest because I don't know the characters. I could actually wish they weren't in the book, although I don't know who I'd replace them with. I don't want any other 1963 X-Men, nor do I want any other 1975 X-Men, because I don't want the book to feel dated, so - I guess Gentle and Trinary are as good as anybody, since they're both 21st century characters. It's cool that Gentle is Wakandan. Because [Phoenix Resurrection] was meaningless and stupid? But of course, I didn't read it, so what do I know? Well, it was the where/when/why/where/how Jean came back to life which means something. PHOENIX: Be alive again, Jean. Be happy. I love you. JEAN: Ugh. Not again. But I have no choice in the matter so OK.
Not one iota of a rationale as to what Jean will do with herself. Well, the mutants and their 'public' school are on display in Central Park so secret identities are probably not priority anymore. Still, it was an odd gesture in light of general personal privacy. The whole public display angle seems underplayed and should be as key to the characters as when IM, DD, Spidey, etc. have been outed in the past. Sentinel Programs, Stevil's HYDRA America, evil anti-mutant groups, etc. probably have reams of census data on mutant aliases by now. Is Wolverinelaura living under her real name? Are X-men codenames a waste of time or just a means for deniability now? So many aspects of mutant acceptance can be inferred by Jean's gesture here. Laura has a secret identity because she has mundane loved ones she wants to protect. One would think the other X-Men have mundane loved ones too, but you'd never know it, as they never interact with any of them. THAT'S the plan? A Uni-Mind Wannabe course of action (unrevealed) but laid out in detail (to only Jean and Kurt and the brainiacs) so far? The story presentation of it just feels... wanting. And the logic of it - uhhh - why not come up with a plan for World Peace if it was that easy to collaborate an easy to do list? It was only easy for Jean, Omega level super-mutant. The religious analogue doesn't jump out at you? Are you talking about the 1963 and 1975 teams? I'm sure we'll get to that. We've seen Kurt so far. Probably next up will be Warren, as I figure his money will prove useful - except I have no idea of the current state of Angel/Archangel. That convoluted story got way out of hand. Did you take Mutant Nation as a people and not a land? Yes. They say as much in the comic. Can the U.N. admit a race instead of a country? Apparently, since they did it in this issue of the comic. Latervia may or may not still be a member but certainly fugitive Iron-Dr.Doom-Man doesn't/shouldn't have one ATM. Oh. Right. Another story that's gotten way out of hand. Yeah. It's fine that 1 rep is from 1963 and 1 from 1975. It all depends how the writer presents the other 5. Having duplicate wolverine powersets COULD be a problem creatively and it will be a challenge to match the entertaining dynamic and shared universe pace of their successful ANW book. Namor will be a big fish to land. Gentle IS cool and could cash in on some Black Panther hype if done better than Queen Ororo ever got. And who the heck is Trinary?? Yeah, it was a terrible mini. That's why it was a lazy 2 MONTH GAP timestamp to write in. It was a missed opp -no, a necessity- to fix some of the fallout from that 'meaningless' event that brought Jean back, imo. But she can't generate ideas from each of the brainiac trust, can she? Or stimulate their thinking potential, can she? Hmm... wonder how long that mind-meld session went on for? That's actually a tough question. Especially with another new conceived X-Telepathic specification involved. The actual feat she performed sorta didn't totally register, at least the way the story read (on my fisrt read thru). It didn't seem Messiah-Level. Could be wrong. Are you saying better than Omega Level? Showings, w/o description details, are probably a subjective thing. Seeing any impressive superpower in action could be a transcendant experience. Quote:Did you take Mutant Nation as a people and not a land? Quote:Can the U.N. admit a race instead of a country? I could swear I've read dozens of stories about the X-Men saving young mutants. Did they all happen in the 21st century? Was it a Morrison thing? 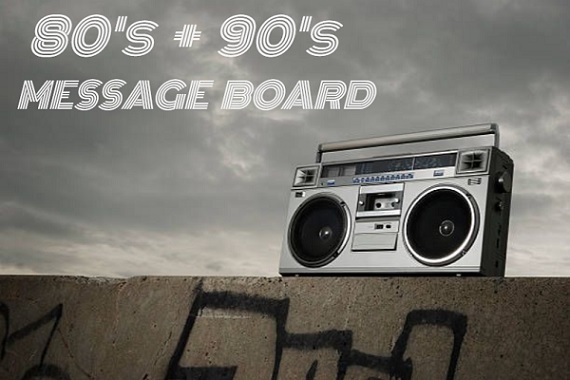 Was it a 90s thing? An 80s thing? Not Storm?! She's supposed to be Jean's BFF, and she's just as religious. She is? What religion does she practice? I love Nightcrawler. He's one of my X-trinity, but he's not a great inquisitive mind that's going to be a good sounding board for any ideas. If I were thinking about building something potentially great, he'd be one of the last people I'd ask for opinions. Unless what you wanted was a spiritual answer. Yeah, plus he (Namor) seems to be providing the HQ (Sea-rebro). I can't wait to learn more about that! I thought they voted. They seemed pretty happy coming out of the building. Going back and re-reading, I definitely get the impression the vote happened and went Jean's way. LAURA: I'm glad we came to watch. That was impressive. HONEY BADGER: Your first step publicly stomped a whole lot of intolerant nations. But I can see I'm much more willing to read between the lines than you and Emerick Man are. This creative team definitely needs to do better as far as providing concrete answers as to what just happened in the prior panels. Jean doesn't want a homeland. She flat out said this. JEAN: And every time mutants have come together to live in one place - Genosha, Utopia - we have simply made ourselves a bigger target. Whenever mutantkind has tried to live alone, apart, we have been slaughtered. She doesn't want a homeland. She wants to be recognized at the UN as a people. A people who are in diaspora around the world. Well, let's see how that turns out. Being the alpha character is not just about having huge and/or kewl powers or being invincible (otherwise Squirrel Girl would be Marvel's clear alpha female ). Carol at least has quite a sizeable track record as a heroine in her own right (and protagonist of various solo series which enabled her to overcome the handicap of being originally modeled on Captain Mar-Vell), while narratively Jean is still largely defined by being one of the original five X-Men and the girlfriend of the O5's undisputed leader as far as her place in the X-Men and the wider Marvel Universe is concerned. Now she leads one of four X-Men teams, but she still has a long way to go to catch up with Storm and various other X-women as an leader, and she has even less traction outside the X-books. (Storm is also a former queen of Wakanda, she has carved out a niche outside the X-books, while Rogue did something similar in the ranks of the Avengers, and Shadowcat was with Excalibur and the Guardians of the Galaxy). 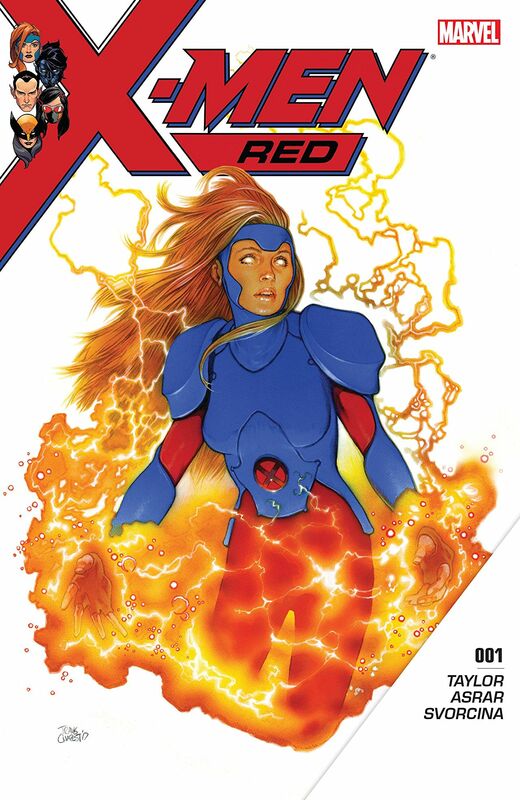 If the makers of X-Men Red now want to make Jean the alpha female mutant, I see that as problematic because she never earned that kind of position on her past showing. Most of this sort of hysteria came later, in the 80s and afterwards. Plus, there really weren't many mutants around back in the 60s and 70s. She's pagan. Her catchphrase is, "By the Goddess!" Or "Bright Lady!" Even then, and that's certainly not what Jean's looking for. Heck, Nightcrawler's never even been able to answer his own spiritual questions. This is a guy who was ignorant enough to believe he'd become a priest of a religion he's supposedly known most of his life, but followed none of the steps to become a priest. Then I completely misinterpreted the mountaintop scene. I thought she was showing Nightcrawler the plot of land she wanted to start with. At this point, I see absolutely no reason behind that entire scene. And her mission seems to be more one of evil than good. You cannot be a nation without a plot of land. Period. That is what the UN deals with. Involving them in this is absurd, and frankly, this plan seeks to undermine every government in the world, including T'Challa's and Namor's (I don't see them going for this). This is exactly the sort of thing Xavier fought against. For someone only used to modern-day X-books it really must be surprising how few mutants were violently attacked by non-mutants for being mutants. In most cases the mobs didn't care whether the guys they wanted to lynch were mutants, altered humans or whatever, indeed in not a few cases (Scarlet Witch, Nightcrawler, Wolfsbane) they thought they were dealing with witches and demons. Most of the time when the X-Men were rushing to find a neophyte mutant it was to recruit them themselves and/or prevent the bad mutants (BOEM, Hellfire Club) from recruiting them. It almost seems to me that the trope of rescuing mutants from mutiphobe non-mutants only became a "big" thing with X-Factor (ironically when the O5 were secretly fueling mutiphobia themselves). Funny how I seem to be an 80s guy when it comes to mutants. I was 19 in 1980. The X-Men had Cerebro from the earliest days (1964) but according to Wikipedia they originally used it mainly to locate evil mutants, which goes along with what you were saying about what the X-Men mostly were about back then: fighting evil mutants. Nevertheless, the Sentinels first appeared in 1965, so "mutant hysteria" dates back to at least then, unless Bolivar Trask was an anomaly. Even then, and that's certainly not what Jean's looking for. It's interesting how obvious the religious angle is to me. Here's something: Jean was raised from the dead. Sure, I know, this is Marvel, no big deal - unless the writer chooses to make it one. It is my contention that this writer is telling a metaphorical Gospel story, much as Roy Thomas did with his original take on Adam Warlock. Only in this story, the Messiah rises at the beginning of the tale instead of at the end. I predict some sort of Crucifixion scenario eventually. Heck, Nightcrawler's never even been able to answer his own spiritual questions. This is a guy who was ignorant enough to believe he'd become a priest of a religion he's supposedly known most of his life, but followed none of the steps to become a priest. Jean didn't go to Kurt to get answers. She went to him to give answers. Kurt is her Simon Peter. As for the bit where Kurt didn't know he was being duped about training for the priesthood - yeah, that story line was so stupid I discount it. No practicing Catholic could ever be so ignorant. Marvel obviously decided they didn't want Kurt to become a priest, so they came up with their ridiculous scenario. The fact that Kurt is the son of Azazel and has various encounters with the demonic realm would actually serve to deepen his spirituality. The truly spiritual are well versed in the dark side. They know the light and they know the dark. They feel both every day. Navigating between the two is almost the definition of real spirituality. That part of the story was Jean going to the synagogues to be recognized. A very interesting question is - Who will be Judas? 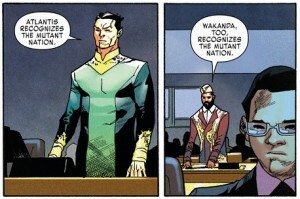 My money's on Namor. I was completely underwhelmed by this book, disappointed and disheartened. I think the ideas kicked around on this board regarding the future of Jean upon her return were better than the execution of this issue. The concept is fine but wasn't this whole messiah thing done by both Cable and Nate the X-Man? The whole issue seemed rushed, contrived and woefully underdeveloped.